Ghostly couture silhouettes designed by Nana Aganovich and Brooke Taylor, the duo behind Aganovich, seemed eerier still once set against the backdrop of a carpenter’s workshop. The models’ faces were constricted by veils, with the occasional addition of fake locks of hair piled on top of their heads. 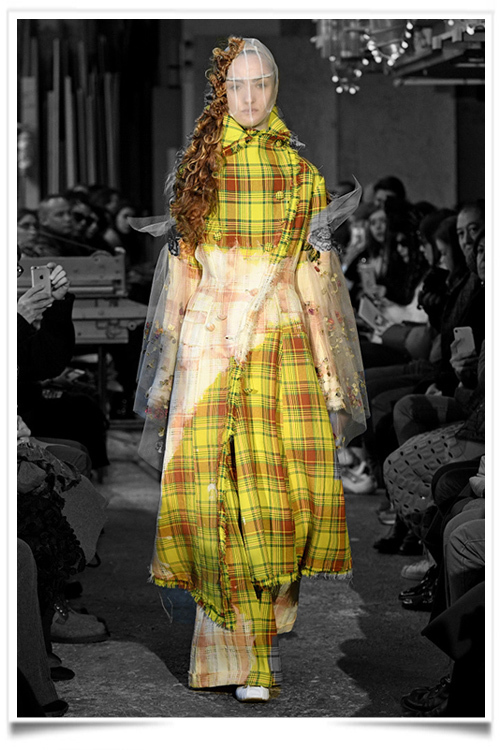 White billowing silhouettes were pitted against yellow plaid suits, a Victorian gown followed a jacket with a structured waist, and a delicate feather-rimmed skirt was given a hard edge when paired with leather boots held up by safety pins. As expected of a couture collection, all the materials were treated in Paris by the label’s atelier. The overall vibe was a bit costumey, but felt in line with the designers’ usual Dickensian silhouettes.